They say that conflict is just normal in work places due to various reasons that never seem to change like professional rivalry, position jealousy, crab mentality, ranking, work attitude, differences in beliefs and bad approach to fellow workers. There are more reasons beyond my observation but those mentioned are the common causes of conflicts especially to companies with a great number of employees. I've been to 6 kinds of jobs and companies but I can say that conflicts and indifferences are not for me as I've tried to adjust myself with different personalities and characters of my co-employees. I easily get along and I can mix with varied kinds but still I have preference with the kind of office friends I stayed with. In my longest ever job I had group of friends whom I became very close and they all left the company before me. With over 20 years of working life I have observed that no matter how different your opinions are you will not be in conflict if you will say your remarks or views nicely. Your colleague wouldn't be insulted or aggrieved if the tone of your voice is calm and not on a high-pitch tone. Everything can be agreed upon but there must be respect to one's opinion first. 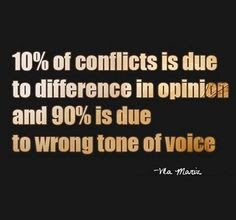 So I agree that a greater percentage of conflict will really come from the wrong tone of voice and the kind of words used.